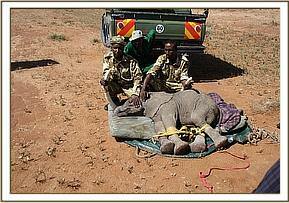 The calf – a yearling female – was transported back to the Mt. Elgon National Park Headquarters, where it was held overnight, and fed only water, the Warden having been warned about the danger of feeding a baby elephant cows’ milk since elephants are totally intolerant to bovine fat. 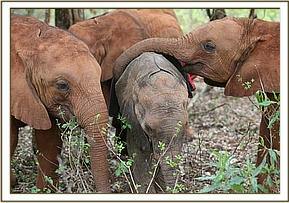 She was flown to the Nairobi Nursery the next morning and was named “Kainuk”- the name of the place where she was found. 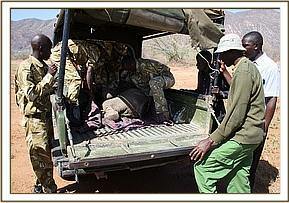 She is a very lucky little elephant to have been found by an ele-friendly tribesmen, for that area is populated by the warlike Pokot tribe, who are better known for poaching, many armed with illegal automatic weapons since cattle rustling is also prevalent in that forgotten corner of Kenya. 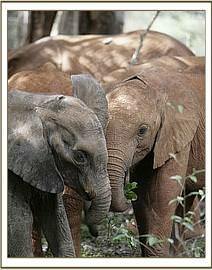 There are very few elephants remaining in the area, particularly now that Chinese Aid workers are on hand to buy ivory and rhino horns, both commodities that are in great demand in Far Eastern countries. 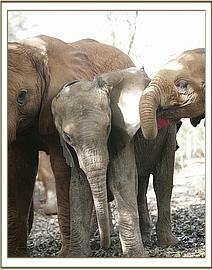 Although very stressed and “wild”, the new orphan took some milk and water from a bottle. She had sufficient strength to give the Keeper in the stable quite a run around, but was very exhausted and slept well during the night, waking up at 3 hourly intervals to take her milk and push the Keeper around a bit more afterwards! 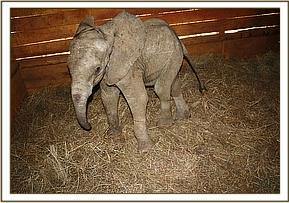 By morning she was much calmer, especially when the other Nursery elephants were brought to her stable to be introduced to her. So eager was she to join them that she was allowed to do so, warmly welcomed by all the older females, particularly the Nursery Matriarch “Olare”, who lavished loving on her and kept her close throughout the day. She was even at the noon mudbath surrounded by admiring human spectators, which was pretty remarkable having been a “wild” elephant baby just two days previously! When she was returned to her stable in the evening, she was again very disturbed and unable to settle, so orphan “Turkwel” was brought in to share the stable with her, and immediately she calmed down again. She was given homeopathic gut stabilizing remedies since the consistency of the stools was becoming loose, but she slept well, took her milk on cue, and seemed fine in the morning. 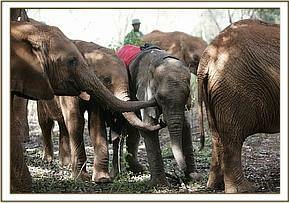 We are very hopeful that little “Kainuk” – the l8th member of our Nursery herd – will continue to thrive, and be afforded a second chance of life – a very lucky little elephant who shares her origin with another two Trust orphans – “Turkwel” (now 2 years old) and “Nasalot” who is now 11 years old, Keeper Independent and possibly pregnant, leading a normal wild elephant life in Northern Tsavo East National Park along with another 28 orphans who are also now integrated into the wild elephant community of that area of the Park. Tsavo is a Protected Area that offers elephants the space they need for a quality of life when grown, and for this reason it becomes the home of all the Trust’s orphaned elephants in the fullness of time. 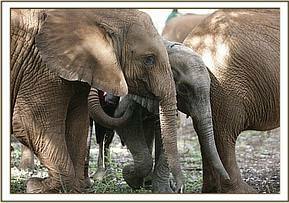 If you feel called by these amazing creatures and want to help, click here to be connected to DSWT.